Writer / News / Books Arrived! Okay, so, it’s actually getting real now. The book looks incredible, and physically touching it, makes it REAL. They say, the moment a writer becomes an author, is when they hold their first book in their hands. It did make me feel different, in a great way. But there was a long way to go before opening that brown box. The fear of everything looking horrible, was terrifying. So many things could’ve gone wrong, but luckily for me – that didn’t happen. The cover was exactly the way I thought it would be, even richer. Opening the first page to my dedications was emotional. Turning the page to chapter 1, I suddenly found myself laughing alone in the kitchen like a maniac. It was just one of those shocking moments, the “wow” moment. Now, on to gearing up for the book launch party next month in a historic church and cemetery! Marketing, so far, is a whole different ball game… but that’s a different post. Aw, this was a very nice post. In thought I wish to put in writing like this moreover ?taking time and precise effort to make an excellent article?but what can I say?I procrastinate alot and by no means seem to get something done. Thanks so much for following, Sanny! Just did Will make it more regular! I predict you will have many more “wow moments”. You have that DRIVE and TALENT that many wish they had. 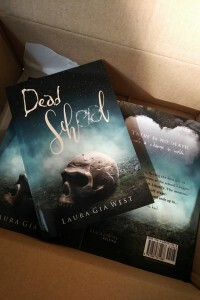 I am anxiously awaiting the book launch and look forward to reading “Dead School”. Your description is so vivid, like I was there with you Good Luck and sell lot and lot of your books!